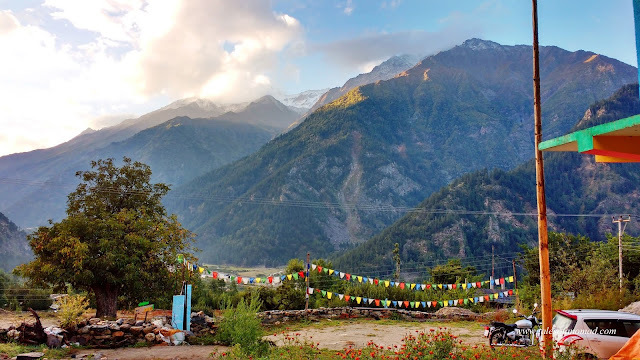 Surrounded by mountains and glaciers, Sangla valley is probably the prettiest region in Kinnaur and is absolutely gorgeous after the monsoons when the valley spreads an array of colours, apples turn red and the climate is pleasant. 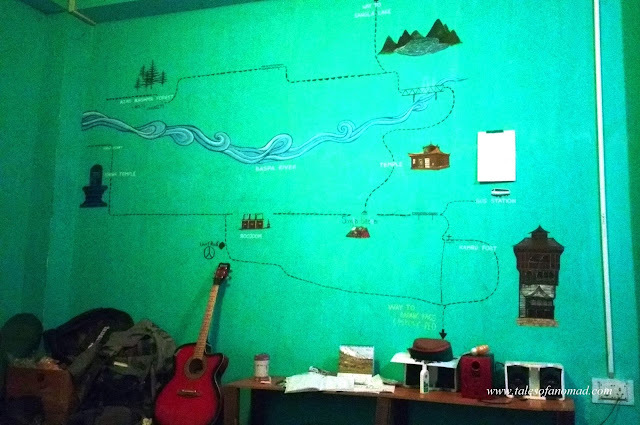 Amidst all this landscape is Roojoom Backpackers Guesthouse, one of the best places to stay in Sangla. 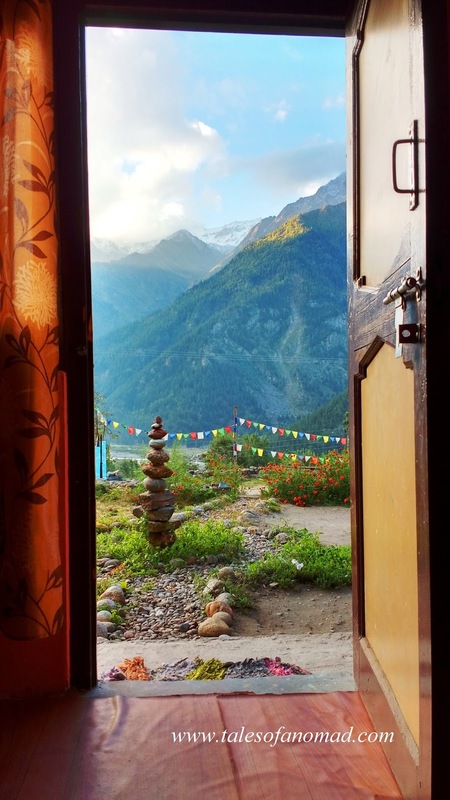 Located a kilometer away from Sangla bazaar on the way to Chitkul, the guest house is a lovely colourful place with fluttering prayer flags, apple orchards in its backyard, a rooftop café and spectacular views all around. They have five rooms, all with attached baths, basic amenities and face the mountains. What more can you ask for?. Location: The views from the guest house are breathtakingly beautiful. It is surrounded by mountains on all sides with the Baspa river flowing way below. Comfortable rooms: The rooms are spacious and well maintained with comfortable beds and quilts. Clean baths: All rooms come with clean attached baths. They also provide hot water on request. Café and common dining area: The roof top café might well be a place you wouldn’t want to leave as the views are surreal. The café is open to outsiders too. The common dining space on the ground floor is a nice place to meet likeminded people and share travel experiences. Joey and his staff: Joey from USA runs the guest house and both he and his staff are very friendly and helpful. 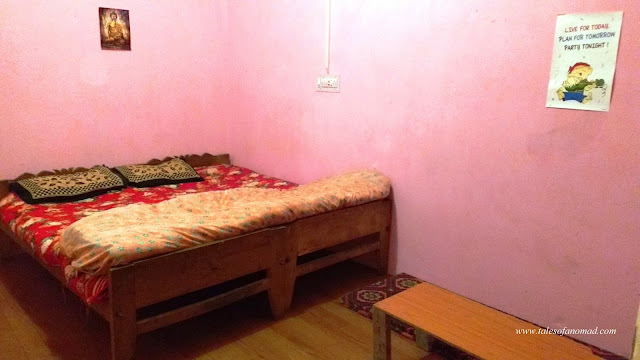 Tariff: This is a good budget option in Sangla and is priced at INR 600 per night for single occupancy and INR 700 per night for double occupancy. Wifi: There is no wifi provided, however, most data networks function well here. Payment: They accept only cash. Sangla Chitkul road, Sangla, Kinnaur, Himachal Pradesh, India. P.S.- This is NOT a sponsored post. A few months ago I was roaming around Sangla in search of a cheap room. I found this one but was packed already. But finally I got another one. Check this out next time. Nice vlog and wonderful pictures. nice location and great view.. Seems like an ideal location. Yeah, that's a major attraction. Thanks for sharing this useful information.Nice clean comfortable budget hotels with hygienic food are important for travelers especially back packers.The room views`are captivating.